Just happen to pop into my mind of how my X's grandfather heated his small engine repair shop. He would pour gasoline in a big galvanized tin wash tub. Strike a match and toss it in before the fumes got too heavy. He did that for most of his life never really had a heater. My experience has shown me that the kerosene heaters are quicker to bring an area up to temperature but the propane heaters are much easier to be around long term with respect to the fumes. I've use both quite a bit and prefer the propane. look for a more expensive version that is used. Thye tend to burn synthetic oils better. Come to Nashville I'll give you the first 15 gallons of used oil, but it is mostly synthetic. I have seen several of these installed with good luck. Not sure what your budget is. (01-10-2019, 06:39 PM)EBSTANG Wrote: Nothing heats like wood and fire is fun. Even the wife will wander out and get lured to the fire...furnaces, torpedos & split systems are not known to enhance the romantic vibe in the shop. Splitting and gathering wood also keeps you healthy. Burn baby burn! That is one heck of a block heater, lol. I bet it does hold the heat a long time. Like heating up rocks and putting them in your tent at night camping. I'd like to get something to heat my garage...at least to keep it above freezing inside. 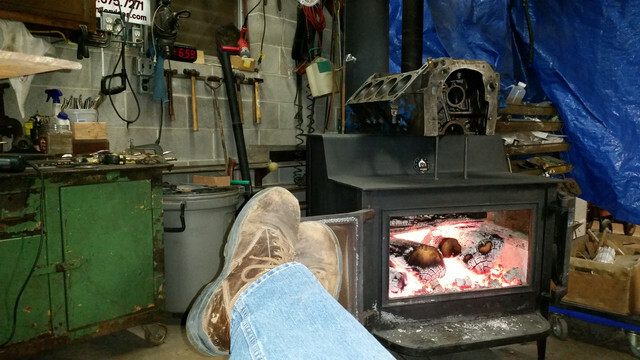 I have a 1200 square foot garage bu part of it is sectioned off so I would only need to heat about 850 square feet. Mini-Split Heat Pump would be the way to go. BKDunha posted a link above. I used too heat a 4 seasons room with one. On the plus you also get AC in summer.